Why does my cambelt have to be changed? HomeCambeltsWhy does my cambelt have to be changed? The cambelt, or timing belt, is made of rubber and is wrapped around several engine components in your car. These components include the camshaft, crankshaft and water pump. The cambelt controls the timing of the engine valves and pistons, making sure they don’t collide with each other. If the cambelt is allowed to fray, snap or simply work its way off the rollers, the pistons can collide with the valves, resulting in an expensive repair bill. 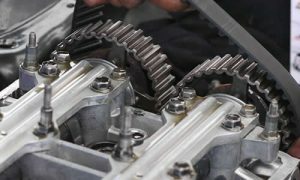 The timing belt is one of the most fundamental components within by your engine, so if you are at all unsure whether it is time for a cambelt replacement, book an appointment with our trained technicians today. After all, it is completely free. It is crucial that you take heed of manufacturer’s recommendations, and have the timing belt changed when necessary, usually around 50,000 miles. This is especially important for diesel engines. Give us a call to check whether the timing belt on your car needs changing, and we will give you a free no obligation quote. If we do spot problems, we can provide you with precise timing belt replacement costs. The Free Cambelt Check includes a cambelt (timing belt) assessment based on your vehicles’ age and mileage. Our expert technicians at the Car Clinic MOT Centre Ellesmere Port will be able to advise you on whether a new timing belt is required and provide a full, no obligation quote for replacement if needed. We will never carry out any additional work without your permission first. For a free Ellesmere Port car repairs quote or a free Ellesmere Port cambelt check just give us a call or pop in.